Hello everyone! Today's prompt in the instagram challenge is heart nails. I love hearts! I always enjoy using heart's in my nail art. 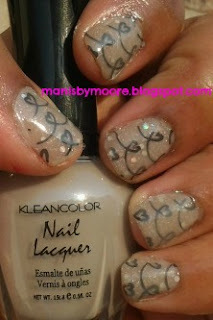 I love this delicate mani. I was thinking stamping with the black would be too much but I love the way it looks! I am so into glitter sandwiches now. This is a glitter sandwich and stampwich. I love it! When I purchased this polish they had a lot of Kleancolors. I kept picking this one up and putting it down and I am so glad I got it! For $1 who could complain. Now after one or two coats it makes your nails look dirty and dingy but much better after the glitter and stamping. Have you tried a stampwich or glitter sandwich?? What are your favorite combos?? Thanks for stopping by! Beautiful! That stamp is so cute, and it looks lovely and delicate. Thank you so much!! I got the stampwich idea from you! Thank you so much! I know right?? I think I will try chalkboard nails soon and use this design. I just have to find a good color to stamp it with.